Where are we? Where is America heading? 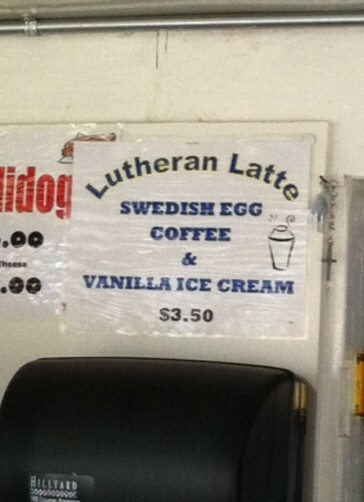 Lutheran Latte at the Great Minnesota Get-Together — Swedish egg coffee with vanilla ice cream — how can you not love it! But if you for some reason don’t, you can have a Meatball Sundae, or one of Ole’s Candied Bacon Cannoli and a cup of Swedish coffee – that’s “The breakfast of State Fair champions” for those who don’t know it, or Norwegian lefse with lingonberry jam at Lynne’s, fried pickles, and anything on a stick: corndog, shrimp, chicken, turkey, long dog…Or you could drink Minnesota wine and any number of Minnesota microbrews. It’s been like this for decades at the end of the summer in Minnesota. 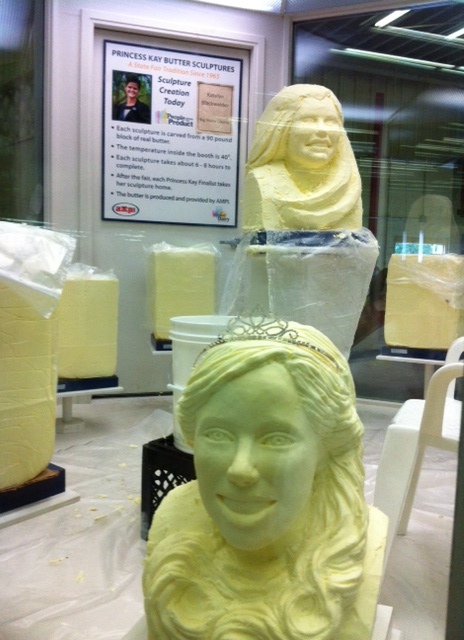 I’ve never seen anything like it, never imagining watching a sculpture of Princess Kay of the Milky Way as the winner of the Minnesota Dairy Princess Program is called, being carved in 90 pounds of the best Minnesota butter in a walk-in, glass-walled refrigerator with people surrounding and watching. Each of the twelve finalists gets her own butter sculpture made and she gets to take it home after the Fair. What a show! In one corner is the Minnesota Democrats’ tent, the Democratic Farmer Labor Party as it is called here, and it is buzzing with activity. DFL runs Minnesota, from Governor Mark Dayton to both houses of the State Legislature and both US senators, and with five of the eight members of the House of Representatives in Washington. And just across the street is the AFL/CIO plaza with numerous union representatives and a big banner calling for higher minimum wage. Senator Al Franken, who is up for re-election in November 2014 also has his own booth, and so does the other Minnesota senator, Amy Klobuchar. Both are at the Fair, on separate days, this steamy weekend, working the crowd and talking to their constituents. 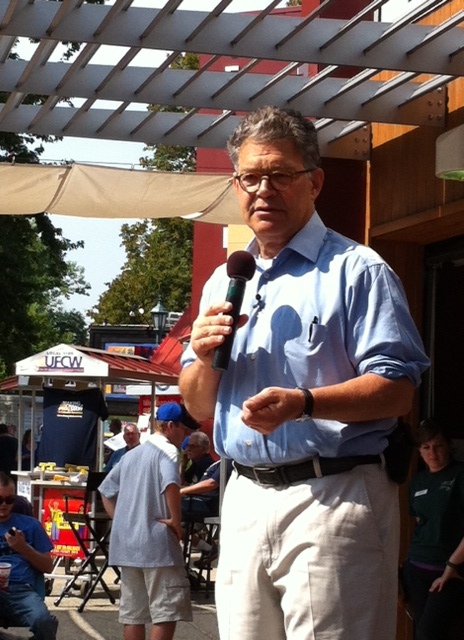 Franken says he loves coming here because he gets to meet people from all across Minnesota, and he asks for support from the trade unions as well as the faithful in the DFL tent, where voter registration forms in Somali, Hmong, and Spanish reflect the new immigrant groups in Minnesota. He loves to quote the former liberal Minnesota senator Paul Wellstone, whose untimely death in an airplane crash in October 2002 in many ways still haunt Minnesota politics, who said, “we all do better when we all do better,” and Franken launches into a fierce defense of unions, of a higher minimum wage, of investments in infrastructure, of college affordability, of protecting social security and Medicare, and of the importance of the Affordable Care Act – he never used the term “Obamacare” – which brings so many good things to America’s citizens. He ends by asking for help in next year’s re-election, when he hopes to get more than the 312 votes by which he defeated Norm Coleman in 2008 – somewhere, he says, in between that number and what Amy Klobuchar got in 2012 when she was re-elected in a landslide, 58 percent to 38. 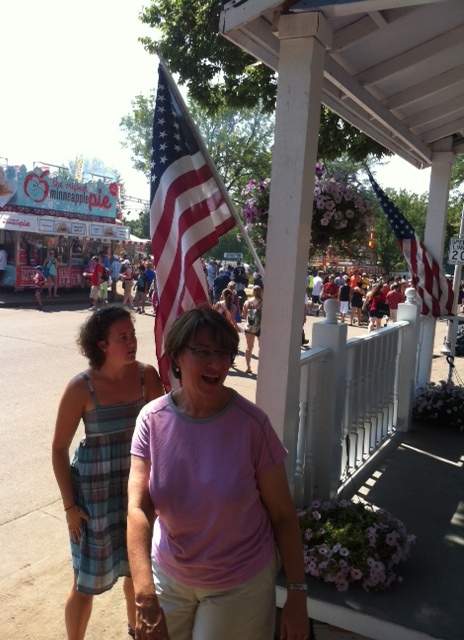 For Amy Klobuchar in the brutal heat, it was the first time, she said and laughed, that she wore shorts to the Fair. No speeches. She is not up for re-election until 2018. But there were plenty of one-on-ones with the curious and the well-wishers, and at the end, judging a food contest. The Republicans are at the State Fair, too, and so are the Minnesota Tea Party, the Libertarians, the Greens, and many others. But in these blue days for Minnesota, they fight a losing battle for attention at the Great Minnesota Get-Together.